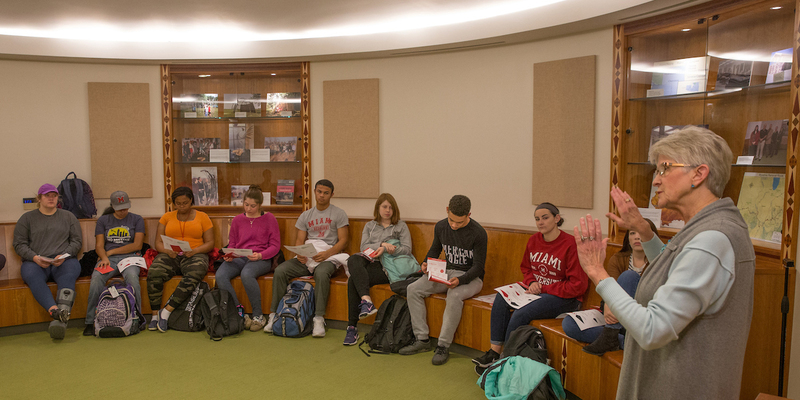 The Wiikiaami Room is a gathering space located within the Armstrong Student Center, on the 2nd floor, that educates visitors about the Miami Tribe of Oklahoma. 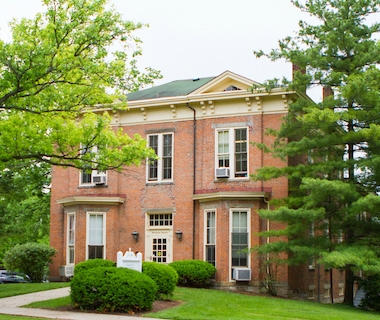 The design for the room originated with a 2009 Miami University architecture studio. It incorporates several elements of a wiikiaami, the Myaamia word for ‘home or lodge’, including the room’s round shape and an entrance from the East. The decorative wood inlay, created by Myaamia artist Jody Gamble, uses a Myaamia ribbonwork pattern. The inlay wood strips extend from the floor through the seating to mimic the poles that would traditionally make up the frame of a wiikiaami. The room’s display cases highlight Myaamia language, culture, and art and show multiple ways students engage with Miami Tribe activities.